March 15 to March 28, 2019. Xi Jinping, the president of China, travelled to Italy for a two-day visit. While there, the two countries signed a memorandum of understanding. The agreement paves the way for Italy to join China's Belt and Road Initiative. Some call it a new Silk Road. If Italy joins, it will be the first EU member country and the first developed economy to do so. 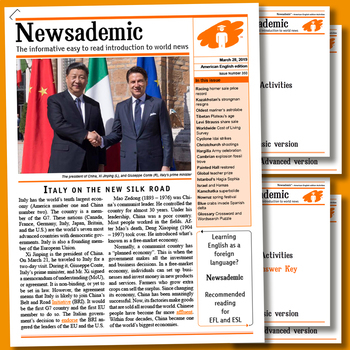 In this issue, we explain what the new Silk Road is and why Italy's interest has angered the leaders of the USA and the EU. Where appropriate, stories feature relevant background and history. Our text is written and edited in an easy-to-understand style. The aim is to encourage students to become more interested in, and more aware of, international news and current affairs. Articles featured reflect no political or religious bias. Stories are reported factually and every attempt is made to feature all sides of any situation in which opinions differ. Those with an * show the articles that have accompanying basic and advanced activities/worksheets. Several issues prevent many students from taking an interest in current affairs: number of news outlets, presentation, article selection, and language are all examples. As "the news" is perceived by many younger people to be adult territory, it’s easy for them to think it irrelevant. These easy-to-read articles are also popular with teachers who instruct ESL / EAL / ELL / EFL students.